"10 common mistakes made by organisations implementing ERP solutions"
The commitment of an integrated ERP (Enterprise Resource Planning) solution can inspire any business owner to approve a costly, time-consuming planning and execution process. However, not all ERP implementations are successful; many end in frustration, failure and wasted resources. To prevent a disaster with your ERP implementation, arm yourself with the right resources to avoid such failure. 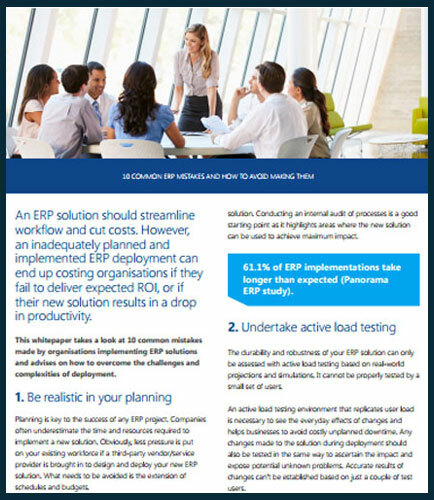 This whitepaper highlights the 10 common ERP implementation mistakes made by organizations and advises on how to overcome the challenges and complexities of ERP deployment. Thus it will help your company make the right decision on choosing your ERP software provider and business software solutions partner, and what to expect from them.